Not long ago I posted on how I make Greek style yogurt. Rachel from And Then Make Soup, commented that if I left the yogurt to drain for a little longer, I would end up with a spreadable cream cheese (rather like Philadelphia or Boursin). Thanks for the tip Rachel! So, in a double experiment, I gave this a go. It was a double experiment as I didn´t have any fresh milk. I know this sounds a little odd, but in Spain it´s still quite hard to buy fresh milk, apart from in the larger supermarkets in the bigger towns. Almost all the milk available here is UHT or Long Life. It´s not a huge problem as I don´t take milk in my coffee and only really use milk in cooking. So…with a litre of semi skimmed UHT at my disposal, I made a batch of yogurt to see if it would work. Nothing ventured, I thought! To my surprise, the process worked equally well as using fresh milk and tasted the same. Instead of draining it overnight, I put a weight on it and drained for 48 hours. I saved the liquid that came off it to make soda bread, but more of that another day. This is what it looked like after 48 hours, straight out of the mould. I beat it up a little and then added one clove of crushed garlic, a sprinkle of sea salt and about 2 tablespoons of very finely chopped parsley. The next morning I spread it on bread for my breakfast, and accompanied it with a very funny looking peach! They´re called Paraguayas here, they have a whitish flesh inside and are very tasty. Luckily I was not going anywhere that morning, as I was rather garlicky for a few hours! I am amazed about your cooking capabilities!!! This is such a tasty recipe and I love the parsley addition!! We also get these peaches in Italy. We called them “pesche tabacchiere, or pesche saturnine and I think these are the best tasting peaches I have ever tried. The flesh is softer than the traditional peaches and they are juicier!! Bravissima!!! You are way too kind! But I do enjoy my little experiments. Don´t really get the chance to cook “flamboyantly” or experimentally in Spain as they are still quite attached to their traditional food and don´t have much of a dinner party culture (at least, where I live). My Italian nieces (the ones living in Anzio!) call thse peaches “hamburger peaches” because they say that they look like little patties of meat! We have those peaches here too – they’re lovely. The cream cheese looks wonderful and what a great idea to use the liquid for soda bread. I’m looking forward to that recipe now! I love them, but we also have a nearby village which is famous for its (normal) peaches. In fact, today is the peach fiesta! I’m so glad you said that was a peach, I was wondering if it was. It’s doughnut shaped too cool. Thought I´d better point it out, otherwise people would be wondering 🙂 Took me ages to buy one at first as I was a bit puzzled by them. How daft can you be?! I’ll book mark this just in case I get brave. Can´t believe you´d be chicken to cook anything! Go on….get that carton of milk out and leave it out in the hot sun, you´ll be done by tomorrow! I must try this, my husband loves Boursin-like things. I’m amazed that UHT was so successful. I was amazed too – after all these years of schlepping 50 km to buy fresh milk! I am a fresh milk person, especially for my tea 😀 and battled with not being able to always get it when we lived in Mauritius. 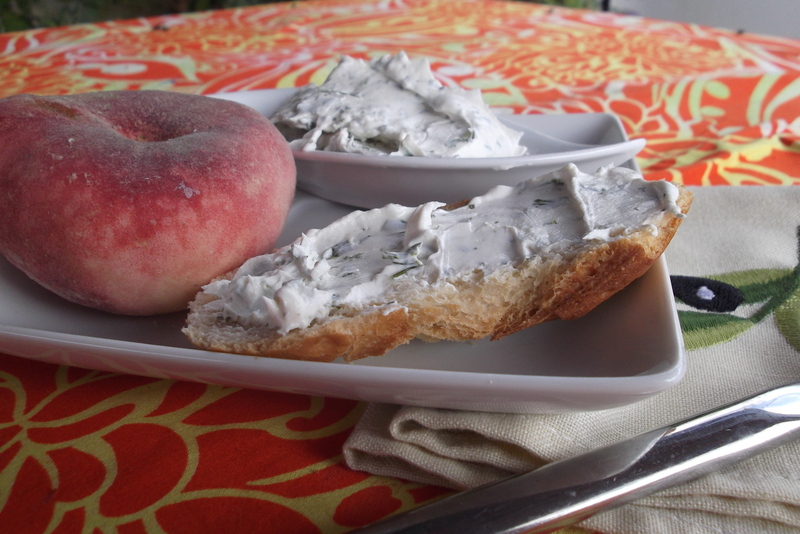 Your garlic and herb cream cheese is a huge success – fabulous. It´s so strange isn´t it – in the UK I never gave a thought to buying anything other than fresh milk. At least you can get it now you´re back home again! It was so easy and the difference in taste was incredible – you could use it as frosting on one of your amazing cakes! Wow! I’ve made Middle Eastern yoghurt cheese, by straining yoghurt and adding spices but I’ve never gone one further and made the yoghurt too! What live yoghurt did you buy as the starter? It was so easy to do. I used a natural unsweetend yogurt from Mercadona I think it´s called bifidus – just one of the little cartons. I´m about 5 batches in now and will probably buy a new starter for the next batch. I’ve seen those peaches here – they call them “doughnut peaches” and they’re yummy! I thought they were “local”, but I guess that’s a relative term as well! You´re welcome – thanks for the tip! Hopefully some time in September we´ll have a glut of figs and am already imagining the taste with the “cheese”! I was surprised about the UHT as well, thought all the good bits had been heat blasted out, but as you say, it must be the starter that does its stuff to make it work. Seems like lots of people have these funny loking peaches…I assumed they came originally from Paraguay becuase of the name they have here….but who knows?! Looks like I´m going to have to keep on straining then I can roll it in some of the lovely zaatar or sumac my mum made me…can´t wait. Can highly recommend making it – you just need a little time and a bit of shelf space in the fridge! PS We also got those squashed looking yummy, very photographic peaches in our stores for the first time this past summer. They have a stunning texture and flavor. Oh, delicious, delicious, delicious. I am falling in love with your blog and the recipes you post. I’m going to have to give this a try as well. This has been the year of learning to cook for me, which means a lot of experimenting and a handful of kitchen disasters. But a few miracles as well. 🙂 I’m a huge garlic-lover, and Spain is thankfully a terrific place to indulge in my love for it! 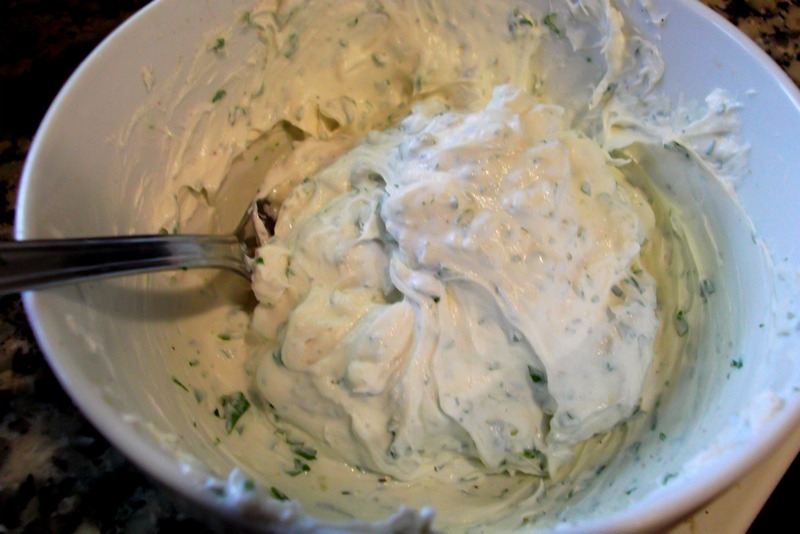 Garlic and herb cream cheese, here I come. Am so gla ydou like what you´re reading 🙂 Can never understand how people can dislike garlic! Learning to cook is the best – I am always experimenting and learning from the successes and faliures (!) – enjoy what you learn. Aah – hope you get to do this! This is so interesting to read. Just wish l had the time to give it a go. Let us know how your soda bread went. Just made some Malted Bread….flour from UK!…delicious! The soda bread was great – so light. Bet yours was good too, I like Dove´s farm flour when I can get it. Hope all is going well for you. 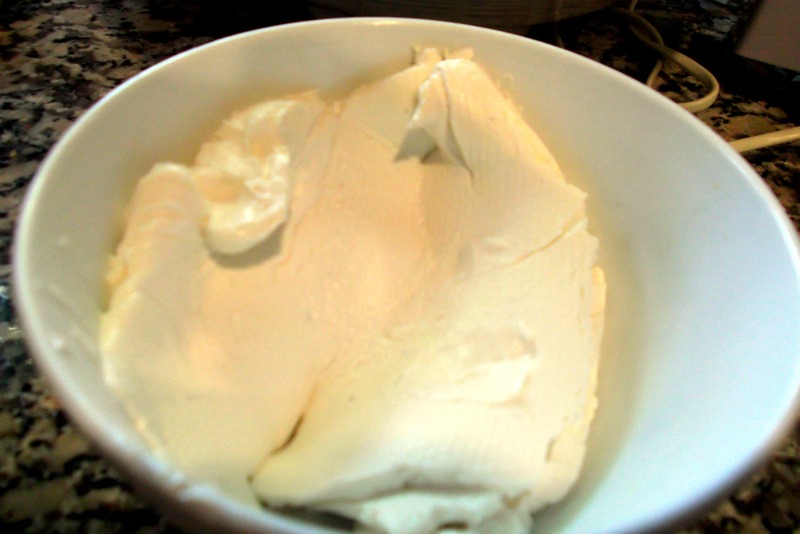 I never really thought about making cream cheese, even though it’s one of my favorite foods to add to things (like sushi, which most people find disgusting!). Always fun to learn something new, and it looks so tasty with the garlic! it´s not so tricky to do (just need a little patience!). I quite like the idea of it in sushi…never thought of it though! I always use UHT milk for yoghurt. It saves you from having to sterilise it!